Allmac Tree Service has been serving Sudbury and surrounding areas for over 25 years. We have earned our reputation every day by guaranteeing your satisfaction with any job we do, large or small. You can be assured we only employ knowledgeable and qualified technicians who will care for your property as if it is their own. Jim Allsop, owner and operator, is a Certified Arborist, a major part of the International Society of Arboriculture and is also a Certified Utility Arborist. Allmac is fully insured with the Workplace Safety and Insurance Board (WSIB) and has $3 million in liability insurance. 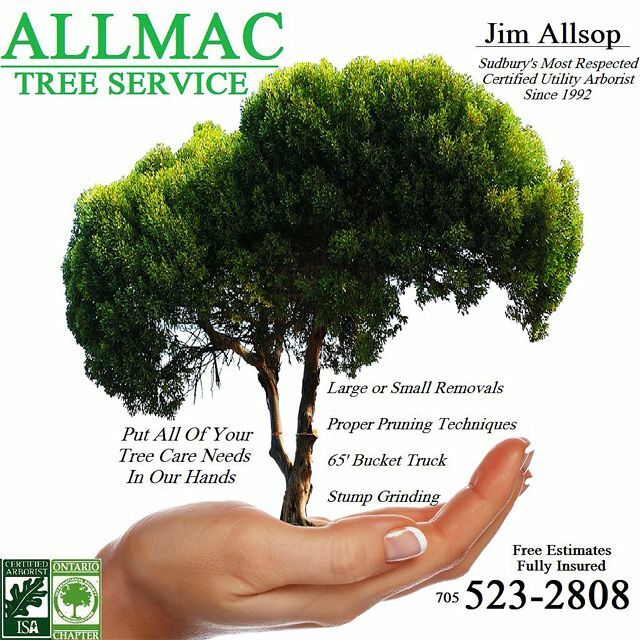 Allmac Tree Service is the company that “will go out on a limb for you.” Allmac Tree Service always looks out for the best interest of your trees, as we know how much we all become attached to them as they grow with you, and they add value to your home. Since 1992, Allmac Tree Service has been Sudbury’s most respected tree doctor; we have all the proper equipment to shape your trees for proper growth and for your safety. Allmac Tree Service performs expert diagnostics for insect and disease damage. If a tree becomes a hazard or nuisance, Allmac Tree Service has over 20 years of experience in safely removing large and small trees, including cleanup and stump grinding. Living in Northern Ontario can have its weather challenges throughout the seasons. Due to ice, high winds, disease or any dangerous tree needs, Allmac Tree Service makes emergency calls 24 hours a day. You can also call Allmac for free estimates for all our other tree care services.